In the fashion world, trends come and go literally as quick as the seasons change. One minute it’s all about colour blocking, the next everyone is going mad for pastel colours, stripes or lace. The trends that we see on the catwalk often tend to filter through to interior design, whether that be the colours, patterns, prints, textures or materials. However, the products that seem to be most influenced by the fashion world are usually fabrics, wallpapers and other soft furnishings. We don’t normally tend to think of sanitaryware as being subject to the seasonal changes of the fashion world. 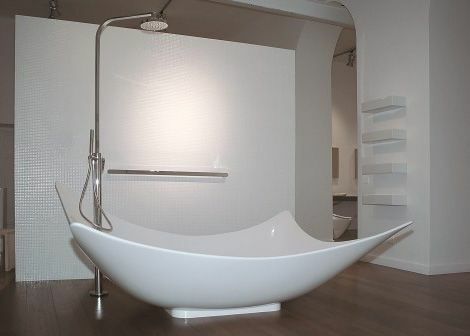 Italian bathroom manufacturer Ceramica Cielo has set out to change that. It’s new Jungle collection is like a haute couture line of sanitary ware that wouldn’t be out of place in a fashion shoot. Following careful experimentaion with an exclusive technology, Ceramica Cielo has found a way to enhance the visual and tactile properties of ceramic giving its new bathroom line a distinctly fashionable look. The unexpected finish is reminiscent of crocodile or python skin and begs to be touched and admired. The collection is available in a more traditional white, a sophisicated black, an exotic dundee brown, an eye-catching cowhide or a racy red. So what do you think? Is this collection the ultimate fashion accessory for your home? Would you like to match your bathroom to your shoes or your handbag? Or is this a step too far?